In what feels a bit like déjà vu, another individual reportedly set to join the Trump administration has been accused of plagiarism. CNN reports that controversial Milwaukee sheriff David Clarke plagiarized part of his master’s thesis on homeland security. 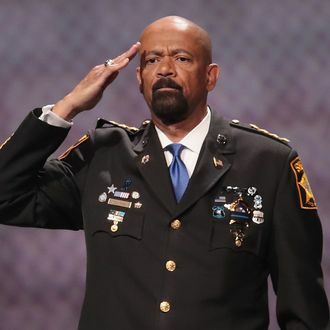 Clarke said this week that he had accepted a position within the Department of Homeland Security, though DHS has not yet confirmed his appointment. Clarke … earned a master’s degree in security studies at the Naval Postgraduate School in Monterey, California. In his thesis, “Making U.S. security and privacy rights compatible,” Clarke failed to properly attribute his sources at least 47 times. In all instances reviewed by CNN’s KFile, Clarke lifts language from sources and credits them with a footnote, but does not indicate with quotation marks that he is taking the words verbatim. Clarke appeared to have lifted lines from such diverse sources as the 9/11 Commission Report, a 2013 Washington Post article, and George W. Bush’s book Decision Points. A side-by-side comparison by CNN illustrated the similarities between portions of Clarke’s thesis and the original texts. The Naval Postgraduate School has scrubbed a copy of Clarke’s thesis from its website, which a spokesperson told the Associated Press was “standard operating procedure” in light of the allegations. He added that the institution is undertaking its own review of Clarke’s thesis.